The U.S. manufacturing sector may appear to be shrinking, but it's making a comeback at the same time. American production remains as hip as recycling and microbrews, particularly in the outdoor industry. We are proud that a few of our preferred gear companies produce homegrown gear. We visited our first stateside factory in April 2013, when we toured Cascade Designs (Therm-a-rest) to see the making of the very air mattresses we use in the backcountry. Let me set the behind-the-scenes action. About 150 workers are seated at various stations in a room the size of a football field. During a single shift, they produce thousands of lights a day. 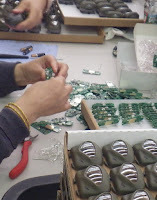 And when I say they, I really mean that production is by hand. From plastic mold creation to lightbulb connectivity to quality control testing to boxing it up and shipping it out. All done by hand. I was under the wrong assumption this whole time that a machine assembled my headlight. I love to see the behind-the-scenes action because it gives you greater appreciation for the product. In the backcountry, we use PTec's Vizz headlights (step-by-step assembly pictured above). The Sync headlight won Backpacker Magazine's Editor's Choice this year! The Helix lanterns are the latest and greatest from PTec. Perhaps the best part is that PTec INCLUDES batteries with all their products. It's the little things that excite me. Princeton Tec has been around the block, creating personal lighting products for 40 years. Still family owned and operated, the business has outgrown a few factories. The company started with making lights for scuba divers in the back of a small dive shop in Princeton, but now, they have lighting solutions for industrial workers, the military and a wide variety of outdoors activities. They are in the process of moving to bigger space again. Like most success stories, Princeton Tec is one of innovation, doing things other companies aren't doing and an unprecedented attention to detail, craftsmanship and quality control. Best of all, they are made in the USA. 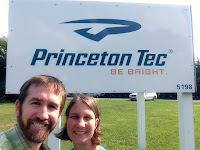 ***We initiated this visit to Princeton Tec and they did not solicit us to write about the visit. I just thought you all would enjoy a peak behind the scenes too.